Table Mountain can be seen and recognized for a distance greater than 200 kilometers offshore, as a sort of a natural lighthouse for sailors going around the African continent. In 1488, Bartholomew Dias and his crew were the first Europeans to ever set eyes on it. 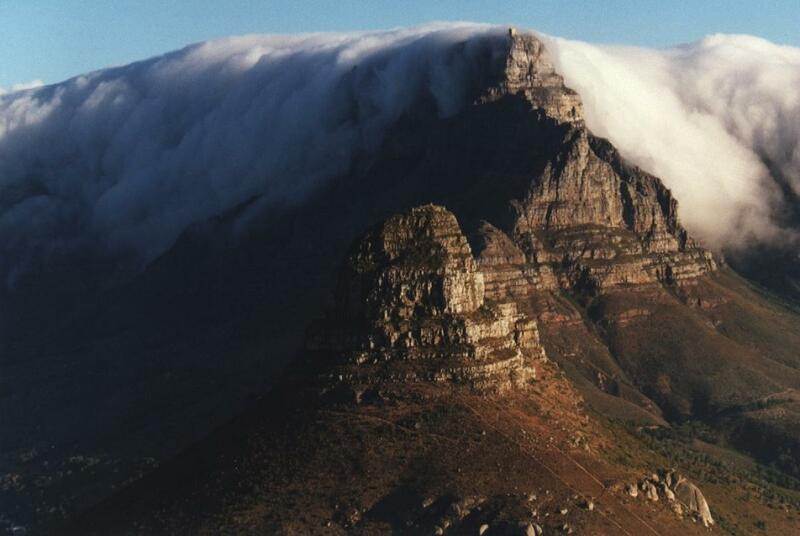 Today Table Mountain is one of the most recognizable natural landmarks in South Africa. António de Saldanha was the first European to land in Table Bay. He climbed the mighty mountain in 1503 and named it Taboa do Cabo (Table of the Cape, in his native Portuguese). The great cross that the Portuguese navigator carved into the rock of Lion’s Head is still traceable. Prehistoric habitation of the area is well attested. About 2000 years ago the Khoikhoi migrated towards the Cape Peninsula from the north, displacing the San and bringing with them their herds of cattle and sheep. It was the Khoikhoi who were the dominant local tribe when the Europeans first sailed into Table Bay. Geologically speaking, the mountain is a huge block of sandstone which was laid at the bottom of a shallow sea some 400 or 500 million years ago. Major shifts in the Earth’s crust have lifted the huge stone to its current height of 1086 meters (3562 ft.) above sea level. The plateau is roughly 3.2 km (2 miles) long, with two distinct features on either side. On one there’s a conic hill called “Devil’s Peak” and the other “The Lion’s Head”. During summer the mountain top is sometimes covered by a thin layer of clouds and mist, giving off the impression of a table cloth. Underneath the mountain, a network of pathways crisscross the green slopes, all cover with wild flowers. The mountain also houses a large number of animal species like the native Ghost Frog, found only here. A cable car can take tourists all the way up to the top of the mountain from where people have an amazing view over Cape Town which is just at the base and on clear days you can even see the Cape of Good Hope.